Prime Minister Shinzo Abe announced Thursday that he will seek to change the government’s long-standing interpretation of the Constitution to lift the ban on Japan exercising the right to collective self-defense. If he succeeds, this means that Japan will be able to take military action overseas when a country with close ties to it is attacked — even if Japan is not under attack. Abe is, in effect, attempting to gut the Constitution’s war-renouncing Article 9 without going through the amendment procedure, which requires the support of at least two-thirds of the members of both houses of the Diet and ratification by a majority of voters in a national referendum. His effort to change the constitutional interpretation in question merely through Cabinet approval could serve as a precedent for future prime ministers to void any clause of the Constitution just by adopting an interpretation backed by a decision of their Cabinet, thus undermining the foundations of Japan’s constitutional democracy. This will endanger the Constitution’s status as the supreme law of the country that binds the power of government and stands above ordinary laws. Lawmakers and ordinary citizens, irrespective of their views on defense and security matters, need to realize what his attempt means for the nation’s rule under the Constitution. Abe based his move to order the ruling coalition parties to discuss reinterpreting the Constitution on a report issued on Thursday by a 14-member private advisory body. But the panel has no legal authority. Its members were hand-picked by Abe and all of them support lifting the ban on collective self-defense. The current constitutional interpretation banning the exercise of that right was officially adopted in a 1981 Cabinet decision following repeated deliberations in the Diet over many years, and the government, mostly led by the Liberal Democratic Party, has maintained it since. Abe is trying to destroy this well-established national principle. In accordance with the ban on collective self-defense, successive governments sought to align Japan’s defense policy to the spirit of the war-renouncing Article 9 — which along with the preamble expresses the Japanese people’s resolve not to repeat the path of militarism — by strictly restricting the use of force. This effort is embodied in Japan’s “defense-only defense” posture, based on the principle that if Japan is attacked it will repel the invasion with the minimum necessary force provided there is no other way to repel the attack. This policy has prevented the Self-Defense Forces from being deployed overseas on military missions and has helped postwar Japan gain the trust of the international community. 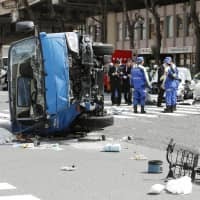 Abe calls for limited exercise of the right to collective self-defense, but this still means discarding the constitutional self-restraint embodied in the “defense-only defense” principle. The advisory panel’s report says that “when a foreign country that is in a close relationship with Japan comes under an armed attack, and if such a situation could pose a serious impact on the security of Japan,” the nation could “participate in operations to repel such an attack by using force to the minimum extent necessary.” Since it would be the government that determines the impact on Japan’s security, it will effectively be able to expand the scope of Japan’s overseas military operations without limits. The panel asserts that Japan needs to be able to engage in collective self-defense because the security environment surrounding the nation has changed, citing North Korea’s nuclear weapons and missile programs as well as “prominent shifts in global power that are transforming the situation in the East China Sea and South China Sea near Japan” — a reference to China’s growing maritime assertiveness. But these examples are irrelevant. An emergency involving China — for example, in the dispute over the Senkaku Islands in the East China Sea — could require a military response by Japan or an intervention by the United States under the Japan-U.S. Security Treaty. But such defensive actions are already permitted under the government’s traditional interpretation of Article 9. It is also unlikely that a possible emergency involving North Korea and U.S. forces would require Japan to come to the aid of an ally under attack. During his news conference, Abe cited a scenario in which Japan offers protection to a U.S. naval vessel carrying Japanese evacuees — presumably during a crisis involving the Korean Peninsula. But such a scenario is highly hypothetical given the gap in military strength between U.S. and North Korean forces. It is also likely that in such a situation Japan would deploy its own vessels to rescue its nationals. The advisory panel lists other examples of when Japan should engage in collective self-defense; they include protecting U.S. naval ships that are vulnerable to attack in open seas and shooting down ballistic missiles targeting the U.S. These scenarios are also unlikely. U.S. naval ships have their own strong defensive capabilities and Japan lacks the ability to shoot down a ballistic missile. In addition, missiles targeting the U.S. mainland wouldn’t pass over Japan. While Abe has repeatedly emphasized that he seeks to enable Japan to engage in collective self-defense in a limited scope, his pursuit — if approved by the ruling coalition and endorsed in a Cabinet decision — will mark a clear departure from the traditional defense policy of postwar Japan. As LDP General Council chairwoman Seiko Noda said recently, lawmakers and people should have the imagination to realize that engaging in collective self-defense means that Japanese will not only end up killing in overseas conflicts but also being killed. Abe also said that Japan’s ability to engage in collective self-defense will serve as a deterrent against military conflict involving Japan. But his administration should also realize that a Japanese declaration of an end to its self-imposed ban on collective self-defense will prompt reactions from its neighbors and contribute to raising tensions in the region.